From Bellingham, WA in the great Pacific Northwest comes Eureka Farm who describe themselves as "pop to the 10th power". Well this is certainly pop music but is far more instrumentally and rhythmically complex than most pop you'll hear on the radio. The band is a trio and includes Arman Bohn on guitar and vocals, Jason McGerr on drums and vocals, and Nicholas Harmer on bass and vocals. 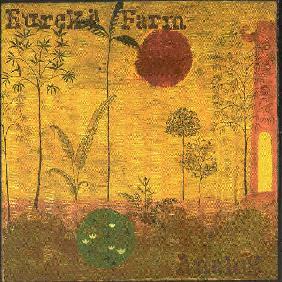 Eureka Farm's influences are diverse citing classic Blue Note releases, Tim Buckley, Can, Traffic, Talk Talk, and Sonic Youth. That's quite a range and while no one of those are individually discernible in the music, the diversity certainly is. The instrumentation is at all times integral to the 'songs' and the vocals are prominent throughout. The harmonies at times reminded me of the avant prog band 5UU's, at others the vocals sounded like the singer from Jane's Addiction, and at others the music of Joe Jackson and even XTC came to mind. So you see my comparisons are as farflung as the band's influences! Among the highlight tunes is "Adrenalin" which was one of songs that reminded me a lot of 5UU's. High pitched, somewhat dissonant vocals are backed by strumming acoustic guitars and a thumping bass line that in the end are joined by a crunching acid guitar. "Headache" is a similar tune though a bit more intense and embellished by some intricate percussion work. Like "Adrenaline" we're blasted by heavier guitar later in the tune, this time a cool sounding fuzz guitar. In fact, this is a bit of a trademark as the band seems to like grooving along and then blasting the listener with the big gun sounds. "Jupiter" is one of my favorites tracks. It starts as an easy-going number with a strumming electric guitar and the slightly jazzy rhythm section found on much of the CD. The pace alternately quickens and recedes until launching into a frenzy during the song's last minute. In summary, this isn't spacerock but would appeal to readers on the lookout for creatively complex pop music. For more information visit the Loosegroove Records web site.